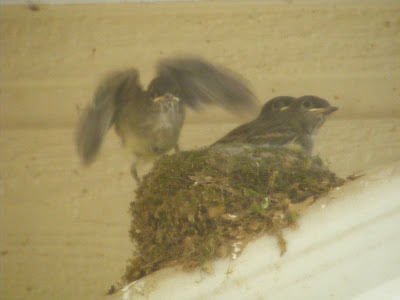 I knew it was just a matter of time before the babies flew away...I really thought it would be over the weekend. Things have been a bit "crowded" in the hood for several days now. Uhmmmm..........so if I don't learn this flying thing the first time I'll end up WHERE?????? That's a LONG way down......THERE!!!! I think the thought of "down there" prompted all the practice flying!!! And then they were gone! 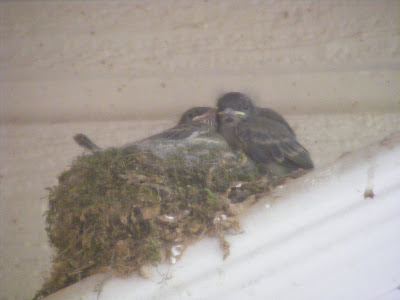 I had hoped to see them actually leave the nest....I went inside for a few minutes, came back out and they were all gone. 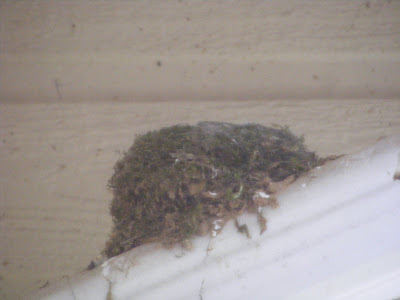 I noticed Mama Bird was at her usual perch......several feet from the nest where she has pretty much stayed for the past few days....she flew back to the nest, saw it was empty, flew into the woods and hasn't been seen since. Ended up getting sick Friday night and didn't start feeling semi-human until last night!!! BUMMER!!!!!!! Ophelia is resting comfortably in the basket, plans are to pick her up tonight and hopefully make some progress. 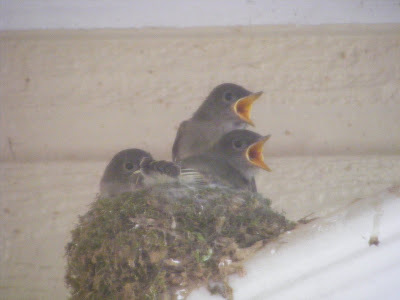 We have been bird watching lately.......the babies are just about to leave the nest!! 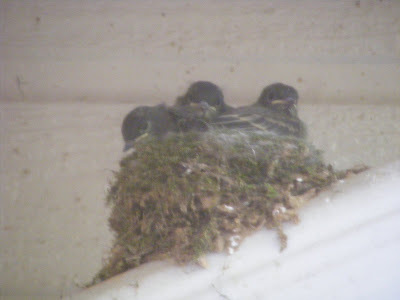 We have enjoyed watching them and will miss them when they fly away, which I truly thought would have been this weekend, judging by the overcrowding in the nest!! LOL!! 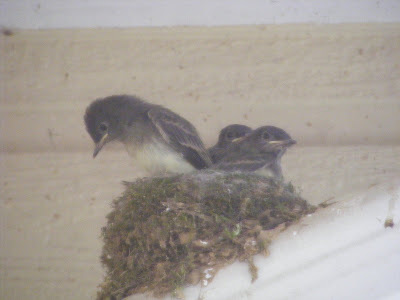 Here are a couple of pictures....the quality isn't too good because the only way to get a picture is through the screened porch, so they are a bit fuzzy. 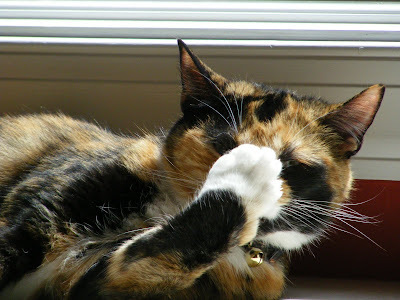 Good GRIEF.....where has this week gone??? 7 days.....and not much to show for it!! Forecast for today is 87 degrees......Woo HOO.....Spring time in Alabama!! My best buds are off to Stitches South yesterday/today and I know they are going to have a BLAST!!! I can not be trusted to look without buying and I have an embarrassingly large stash...last count over 100 skeins of just sock yarn....couldn't bring myself to count the other yarns. Needless to say I have a problem with sock yarn!! LOL!! So I opted out for this year but hope Stitches South is a WONDERFUL experience for those that go and that they will consider the South "worthy" of returning next year!! I have bought some carders and waiting on some fleece samples to arrive so I can choose a fleece. I can't WAIT!!!!!!!!!!!!! A bit of knitting this week, but I'll post that later. 1. Apparently there's some sort of weird electronic conflict in this house, every day it is something new that doesn't work or work properly!! UGH!! 2. I do love me a sunny day. 3. 2009, has been a very blessed year so far. 4. Once I took a long hard look at my stash, that was it.....must stop the madness!! LOL!! 5. For too long I've been putting off exercising, eating properly and taking care of myself!! I just don't LIKE to do all that!!! By the time you reach 50, you should be able to eat what you want and do what you want!!!! 6. 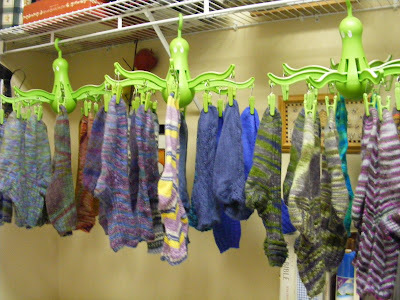 I am not obsessed with collecting yarn ; I am not! (STOP laughing). 7. And as for the weekend, tonight I'm looking forward to possibly going to a wine tasting party or staying home, ordering a pizza and chilling, tomorrow my plans include heading to my BFF friend Cindy's house to help her set up her wheel for double drive and setting up her new Woolee Winder and Sunday, I want to stay in my p.j. 's all day and do whatever I darn well please,catching up with my buds that went to Stitches to hear about all the loot they came home with!! LOL!! 1. Join me in running away....far, far away!!!!!!! 2. Put a little Margarita in your day! (or maybe a large one???) Hee Hee! 3. Happiness is having family and friends that love you!! Oh...and YARN!! 4. Stressed, dazed and confused. 5. I'm waiting for MY time!! 7. 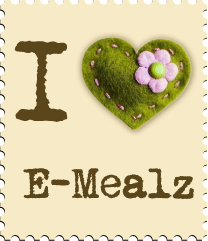 And as for the weekend, tonight I'm looking forward to eating a hamburger, tomorrow my plans include laundry, working in the basement, and Sunday, I want to KNIT!!!!!!!!!!!!! 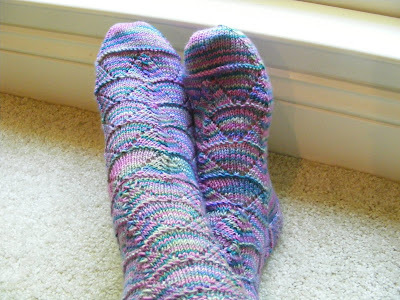 I know, I know......Ophelia is waiting, Spring is here and it will be perfect to wear ....and yet I knit another sock!! Duckies pattern, knit with Miss Babs Sport Weight, color name to be listed once I find that ballband....I know...I KNOW.....I was going to do SO much better this year with keeping up with Ballbands..........(insert large sigh). Some things/people never change!!! LOL!!! We spent a day visiting with the family, did manage to sneak a bit of knit time and finish one of the Festooned Frippery Sock. 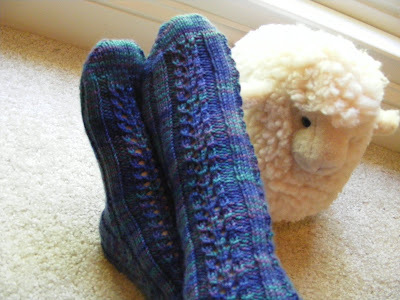 This is such a fun, easy sock to knit!! I haven't worked much at all on the Ophelia vest....but did cast on for another sock....(I don't know why I even TRY to knit anthing else....I keep coming back to socks)....I think this last pair I cast on makes pair 34????? 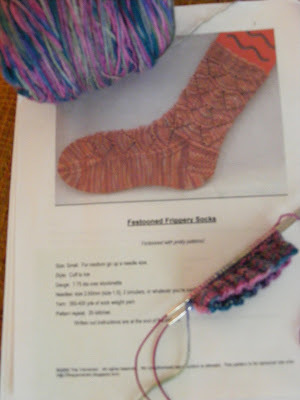 Hi, My Name is Darlene, and I am addicted to knitting socks. 1. Anonymous...is all about being FREE!!!! 2. Getting older is a good thing....most of the time. 3. Let me embrace thee, sour adversity, although I would rather STRANGLE you!!! 4. Watching everything bloom is what I look forward to most about Spring. 5. Who needs therapy when there is knitting!! 6. PEEPS MUST go into the Easter Basket! 7. And as for the weekend, tonight I'm looking forward to knitting, eating BBQ, tomorrow my plans include the annual clandestine, late night hanging of easter eggs on the "Easter Tree" at my God Daughter's house and Sunday, I want to REJOICE.....and enjoy Easter lunch with my family!! It's the invasion of the SOCKTOPUS!!! Grace picked these up for me from IKEA....the PERFECT way to dry socks...of course Heidi isn't too happy, she can't knock the socks behind the dryer.....boo hiss! The weather this weekend was GORGEOUS...of course we are back to cold temps and a freeze warning for tomorrow night!! Ahhh....Alabama weather!! 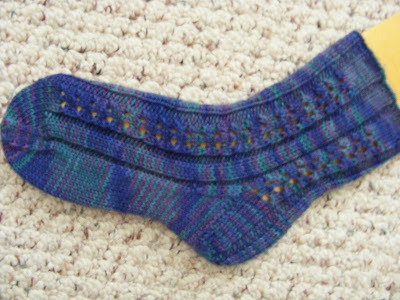 Between pulling a few weeks I managed to finish two socks for a total of 2 pair. 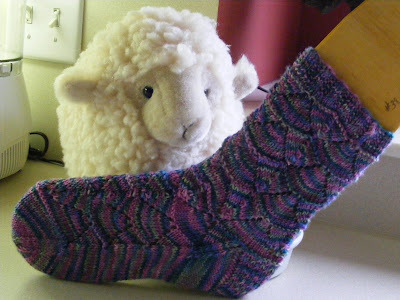 The pair on the left are for me.....knit with Koigu sock yarn (my first time to use this yarn).....in the Groovy Socks pattern from Sock Pixie and this may be my new favorite pattern!!! Super fast, not much thinking involved....yep...I like it!! 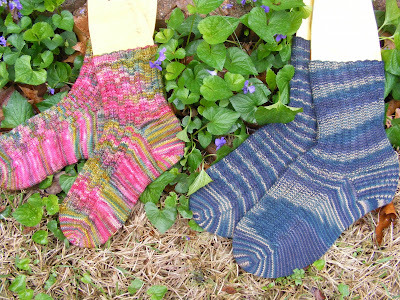 The pair on the right are a pair of garter rib socks knit with KnitPicks sock yarn for my DH. 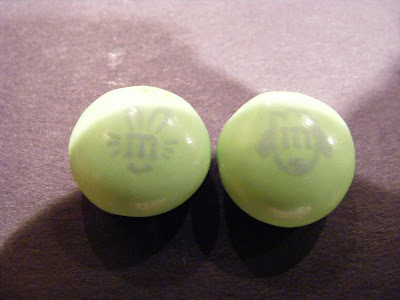 I took this as a sign I should be knitting, ditched the weed pulling....(cute little bunny and sheep M&M's)!! 1. 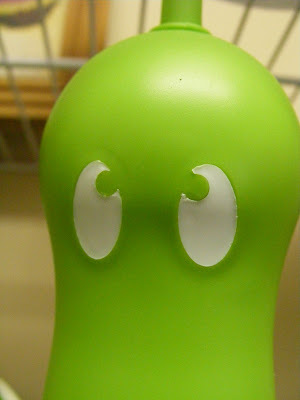 Angel or not, I will speak up, loudly if necessary to right wrongs. 2. If you show up with yarn you can have me any way you want me. 3. As my mother used to say, you're full of hmmm....I don't recall my mother telling me I was full of anything....perhaps I am in denial?? LOL!!! 4. I HAVE to take a shower after I'm done working out or doing something strenuous. 5. Even in the most crowded of rooms I feel self conscience. 6. Every Day is a day fraught with peril. 7. And as for the weekend, tonight I'm looking forward to watching ER as we lost power due to storms, tomorrow my plans include cleaning one flower bed (pacing myself..LOL!! )....and Sunday, I want to cook and knit, my two favorite Sunday afternoon activities! If it is Wednesday, that means it is WHISKERS ON WEDNESDAY!! After 6 days of recuperation from shoulder surgery, my DH is back at work!! Not sure if Bella was waiving goodbye, best wishes on your first day back at work or if this is some international kitty symbol for "you are invading my space now LEAVE" message!! LOL!! Hmmmm....for some reason I don't think it was a "sweet" message! LOL!! On my needles and a FO!! 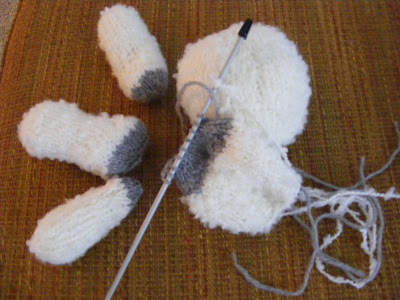 I am finishing up two pairs of socks, should hopefully have them completed tonight or tomorrow, I have completed one sock and ready to start the mate.....I have OHHHH so many projects knocking around in my head that I want to get started on, just not enough hours in the day!! Oh yes....my F.O. .....as in FUTURE OBJECT!! LOL!! 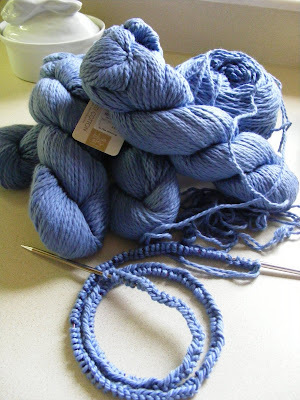 Blue Sky Alpaca cotton, so, so soft and destined to be Ophelia. I absolutely LOVE the cornflower blue color!!! This will be my first time to knit with cotton and hoping that Ophelia will play nicer than Juliet did!! !